The School of Earth, Atmosphere and Environment maintains two Petrographic Laboratories, a Student lab and our EAE Technician's, (Junnel Alegado) lab. 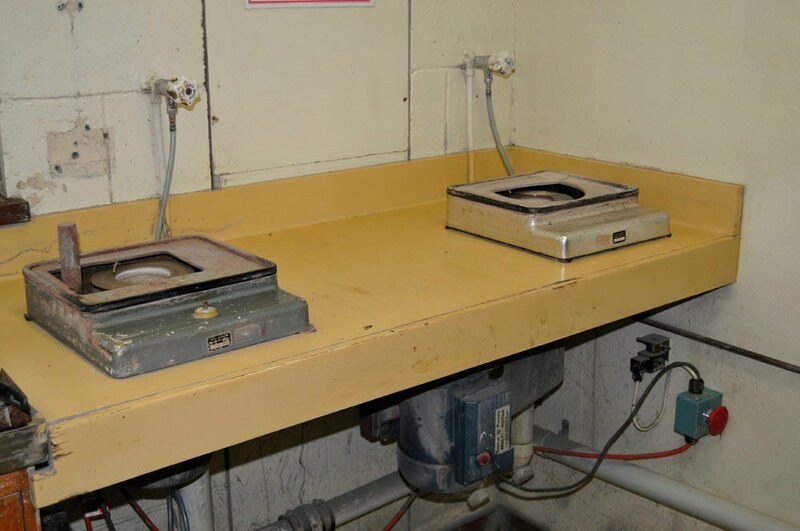 These thin-section preparation facilities are also available for contractual work by external clients. 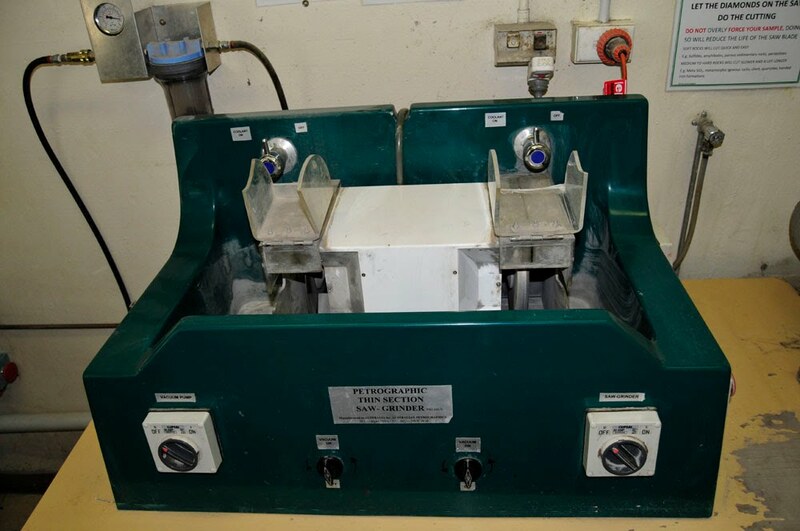 Once a sample block has been glued to a glass slide, it is ready for further cutting and grinding on the 'Petrographic Thin Section Saw - Grinder'. Nicknamed the 'Green Machine', samples are cut to a thickness of between 200 and 100 microns (0.2mm to 0.1mm). Any lower, and you risk your samples fracturing (not the glass but your actual sample), producing textures in the thin section that are not a true representative of the rock sample. We house saws to cut large rocks up to 30cm diameter. Brick saw: cuts rocks that have a height of 11cm high. Large semi automatic saw: cuts rocks that have maximums of 22cm high and 30cm depth. small semi automatic saw: cuts rocks that have maximums of 15cm high and 17cm depth. Manual hydraulic down press to break rocks quickly and easily. Trim saw: Trims thin slabs (no higher then 4cm) to smaller block sizes for thin sectioning. The diamond Grinding Wheels are used primarily to remove saw marks from the samples that have been trim sawed. It is also used to roughly flatten samples ready for final flatness preparation. It is recommended that samples are grinded using the whole surface of the wheel to promote flatness and reduce the likelihood of having a concave and/or convex wheel. The grinding wheels are roughly 100 to 200 grit. They require water as a coolant and is also used to minimise dust inhalation during the grinding of rock blocks. Other equipment in the lab which assists in making thin sections is listed below. For more information on this laboratory and its capabilities please contact our Technical Officer.